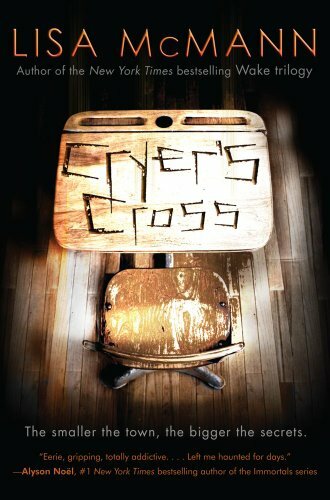 Synopsis: The community of Cryer’s Cross, Montana (population 212) is distraught when high school freshman Tiffany disappears without a trace. Already off-balance due to her OCD, 16-year-old Kendall is freaked out seeing Tiffany’s empty desk in the one-room school house, but somehow life goes on... until Kendall's boyfriend Nico also disappears, and also without a trace. Now the town is in a panic. Alone in her depression and with her OCD at an all-time high, Kendall notices something that connects Nico and Tiffany: they both sat at the same desk. She knows it's crazy, but Kendall finds herself drawn to the desk, dreaming of Nico and wondering if maybe she, too, will disappear...and whether that would be so bad. Then she begins receiving graffiti messages on the desk from someone who can only be Nico. Can he possibly be alive somewhere? Where is he? And how can Kendall help him? The only person who believes her is Jacian, the new guy she finds irritating...and attractive. As Kendall and Jacian grow closer, Kendall digs deeper into Nico's mysterious disappearance only to stumble upon some ugly—and deadly—local history. Kendall is about to find out just how far the townspeople will go to keep their secrets buried. My Review: I’m a huge fan of Lisa McMann’s other trilogy. I’ve yet to get my claws on the final book, but Wake and Fade are some of the most original pieces of YA fiction out there. When I heard that she was writing a new series, saying that I spazzed is a bit of an understatement. To be honest the synopsis didn’t intrigue me that much, but I was firm in the belief that I just had to read it. I don’t know why I ever doubted. Lisa definitely throws you into the middle of the action. The story immediately starts off with Tiffany’s disappearance. The fact that her disappearance happened in such a small town, where everyone thinks they are safe is just bone chilling. Remember Anne Sluti? Ya, I live in the same town. Crap like that happens everywhere. That just makes it all the more terrifying. Lisa paces the story well. Summer has come and gone and Tiffany’s disappearance is just an ugly memory. That is until Kendall’s “boyfriend” Nico starts acting strangely. I won’t reveal anything, but boy do I just have to say that Lisa McMann has one creepy mind. I LOVED the little paragraphs between the chapters from “them”. It was raw, bone-chilling, and just creepy as hell. I love horror stories, and Lisa sure did deliver. I’m rarely creeped out by novels, but man I was a feelin the shivers. Masterfully done, and I cannot wait for more! This is just the beginning and I am definitely looking forward to more heebie jeebies. Lisa delivers yet another highly original novel that will have you hiding under your covers. Hey Ky! I just read this book today! CREEPY AS HELL! I loved it! I gotta read Lisa's other series ASAP! I agree with you though the story was very original=) Great review! Oh and I loved the cover super creepy after reading the book. OMG I know! How the hell did she come up with that?! I was just like O.O *blubber* Creepier than any horror flick I've ever watched for sure. The 18th: Es mi Cumpleanos!